I am foxed by the use of dots and stipples to produce shading especially when that involves using a biro which has a very thin point and hence involves a lot of time in the production of an area of shade with small dots—-and feels virtually impossible. Here Gilman, who was one of the Camden town group, uses line as the predominant vehicle of his picture making but stippling as areaas denoting shadow. There is no great depth of tonal contrast, perhaps due to the use of the fine stippling as shade. The picture also shows a compositional feature of central figures but the eye is taken by the roof’s perspective into the distance. Here Van Gogh uses dots and stippling in the middle distant fields and straight and curved lines in the foreground. This seems to give a greater sense of movement in the foreground and activity but not of any variety in the mid ground. The stippling does not vary in size of “dots ” nor their distance apart as they reced further from the eye. 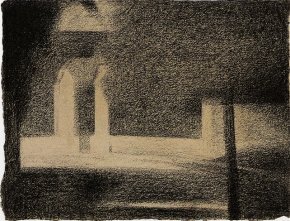 I have been trying to achieve a depth of tone with stippling and dots but perhaps it cannot lend itself to the intensity of shade found in Seurat’ pictures–perhaps it represents more of a graduation between none shade and shade with little propensity for a graduation through shade itself.